The herringbone brick effect fireback and the ceramic logset come with the stove as standard. 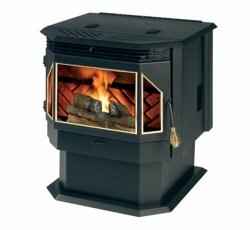 With emissions at a low rate of 1.43 grams per hour, the Englander 25EP is one of the cleanest burning pellet stoves available and has a firebox that is easy to clean out. Max. Heat Output 25,000 btu. Window Size 22.5 in. by 11 in. Rear Vent Height Freestanding 16 in. Insert 7.25 in. Metal structure of the stove is covered for five years. Mechanical parts, electrical components and glass are covered for one year. Original purchaser only. 29.25 in. by 40 in. Operate the heat exchanger cleaning rod. Scrape burn pot clean. Clean ashes into ash pan and empty ash pan. Remove the firebox baffle and clean fly as from behind. Clean the stove's exhaust chambers, Inspect and clean the venting system as necessary. Clean the combustion and convection blowers. Clean dust from the hopper and auger. Check gaskets for airtightness. Inspect flue and clean if necessary. 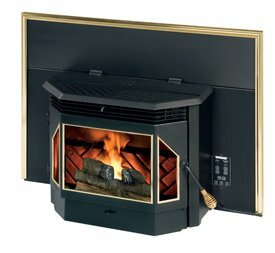 If you would like to leave a review of the Englander 25EP pellet stove or fireplace insert, please use the form on the contact page.